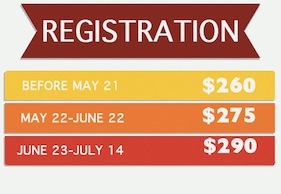 Of our three summer Workshop programs, SLW is the biggest by far. With hundreds of student leaders flooding Wayne State Campus for five days, it’s a non-stop party with important life lessons at every turn. Maybe you’ve been to summer camp, or sports camps or other summer activities; but you’ve never seen anything like this. SLW is five days and four nights of leadership immersion. 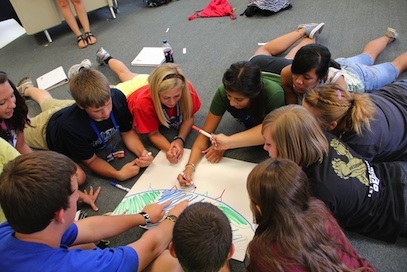 You’ll work primarily in small groups called “Co-ops.” Here you’ll get to know 10-12 other high school student leaders. You’ll learn from them and from your NASC Staff leaders as you navigate hands-on leadership activities and discuss how to apply the lessons to your every day life. We’re not about pretty-sounding leadership “theory.” Anyone can tell you that “time management” is important. What we’re here to do is help you see how it’s important, and how you can implement it into your life year-round. Workshop may only be 5 days, but we make darn sure that what you learn there lasts for the next 360. If you think a “leadership workshop” doesn’t sound like the most fun thing in the world, we hear ya. So you’ll have to take our word for it, and take the word of anyone who has ever been. It starts with a morning dance party and continues to ice cream eating contests and four square tournaments at lunch. On the second night, we’ll pit you and your co-op against the rest of the Workshop in a huge Olympics competition, and on the last night there’s a huge outdoor dance party. Those are just a few of the ways we cut loose and have fun throughout the week. Wanna know the rest? You’ll just have to see it to believe it. But check out this video to get a little taste of what a week in Wayne is like. SLW is held in Wayne, NE, on the campus of Wayne State College. You’ll stay in actual college dorms and learn in college classrooms. Our friends at Wayne State give us the run of campus for a week, and we take over. So you’ll get a little taste of what college is actually like; minus any boring lectures. We strongly recommend coming to Workshop with friends and people from school. You absolutely don’t have to be in student council to come, but lots of student councils come and bring many of their students. You can carpool up with folks you know and see them throughout the week. That said, if you don’t know anyone at Workshop, you will in about 5 minutes. We’ll make sure of it.